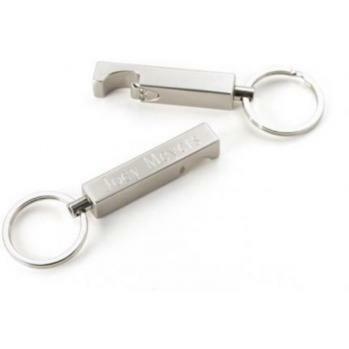 Personalized Keychains This sophisticated keychain is securely attached to a brushed stainless steel bottle opener – a dynamic duo. Fine craftsmanship guarantees a long life free from rust or tarnish. (Please don't drink and drive.) SIZE: 4" long PERSONALIZATION: Personalized with one line of up to 20 characters.